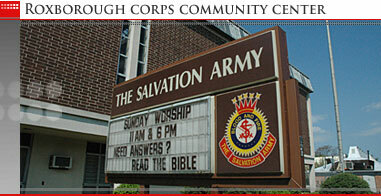 The Salvation Army Roxborough Citadel Corps Community Center has been serving God and people in Philadelphia since 1889. Small groups and activities that encourage fellowship, education, service and worship are offered throughout the week. Sunday worship blends traditional and contemporary music with Bible based preaching to lift the spirit and prepare people to effectively live out their faith. People from different walks of life find opportunities to learn, worship, and serve together at our centrally located facility at 6730 Ridge Avenue, the heart of Northwest Philadelphia. A well established program for seniors, The Salvation Army Ever Young Club, includes a weekly meeting, exercise classes, and regularly scheduled outings. The Salvation Army Music and More program helps children age seven and up learn fundamentals and develop skills in voice, brass, piano, percussion or mime. Opportunities are also tailored to the interests of other age groups. People often comment on how welcome they feel at The Salvation Army. Our activities are motivated by our love of God and desire to serve others, creating a spirit that will make you feel right at home. Monday - Thursday, 8:00 a.m. - 2:00 p.m.